Flea beetles are worse that usual in some areas, with growers spraying more than once and with heavy feeding carrying on past the 4-leaf stage. Cutworm losses are low in general but flaring up in some areas. Aster leafhoppers are at much lower numbers than last year and the aster yellows threat is minimal based on what we know at this stage. Cabbage seedpod weevil numbers are picking up and some southern Alberta and southwestern Saskatchewan fields are close to flowering. 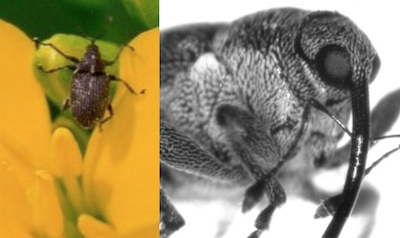 Early flowering is the control stage for cabbage seedpod weevil adults — as long as they’re at economic thresholds. Growers who used elemental sulphur for their sulphur source this spring may need to top dress. Elemental sulphur will not address sulphur needs in the year of application. Keep an eye out for signs of sulphur deficiency in the bolt to bud stage. A possible answer for fields too wet for the sprayer: Aerial. Given the negative economics of late herbicide spraying on canola (see last week’s article), growers do have aerial options if weeds are getting away on them and the window is closing. Sclerotinia stem rot risk increases with rain. Moist soils during the two weeks before canola flowering begins will increase sclerotia germination in the soil, and increase the number of apothecia shooting spores into the canopy. Any rain at flowering will put canola growers at the same risk as last year, and last year was a heavy year for sclerotinia stem rot. Don’t bother spending the money on a petal test. With moisture, spores will be everywhere. You have to scout to know what’s going on in the fields. Here are 10 things to look for this week. 10 – Gopher damage (Richardson ground squirrels or pocket gophers) Read more. 8 – Wild buckwheat. Read more. 7 – Herbicide efficacy. Is weed control what you expected? If not, why not? Read more. 6 – Flea beetle. Not all canola is safe at the 4-leaf stage. Read more. 5 — Cutworms. Missing plants? Start digging. Read more. 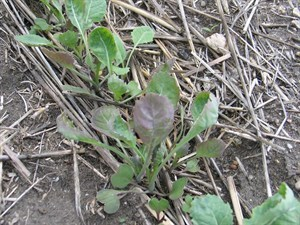 4 – Herbicide carryover issues. Read more. 3 – Seedling diseases. Read more. 2 – Cleavers. Read more. 1 – Plant stand. What is the plant survival rate? Deep seeding is one issue causing establishment problems this year. Can definitely see areas in fields were drill settings were a problem. This leads to increased disease, delayed establishment, higher flea beetle risk as the treatment wears off, and generally low vigor. Read more. Listen to a podcast with CCC agronomy specialist Keith Gabert on what to scout for this week. Cutworms are spotty but keep scouting. Flea beetles may need to be controlled past the 4-leaf stage in some extreme cases this year. Cabbage seedpod weevil numbers are building but only spray after first flower and only if sweep net results show them at thresholds. Hold off on early grasshopper control. Growers who used elemental sulphur as their only sulphur source may see deficiencies in this year’s crop. Elemental sulphur will not be available when the crop needs it. In following the 4-Rs of fertilizer, elemental sulphur applied at seeding is not the “right source” or the “right time.” Sulphur deficiency symptoms (see the photos) that appear at the bud to bolt stages can be fixed with a top-dress of ammonium sulphate, a highly available source of sulphur.